The first all-in-one zoom lens to achieve wide-angle-to-long telephoto coverage (28-300mm equivalent) along with outstanding imaging performance, it's still the world's lightest, most compact 11.1X zoom lens in its class. Ready for virtually any photographic opportunity -family events, distant wildlife and sports action, compelling close-ups of the kids -it does it all without having to change lenses. Advanced Tamron technology -special XR and LD glass, Hybrid Aspherics, and Internal Focusing -is what makes all this possible in a dramatically downsized package. Cutting-edge internal and external multi-coating assures flare-free pictures even under challenging conditions. With specs like this no wonder it's Tamron's most popular lens. 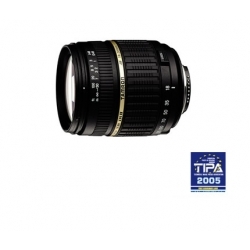 The Tamron AF18-200mm F/3.5-6.3 XR Di-II LD Aspherical (IF) MACRO is a high power zoom lens designed exclusively for digital SLR cameras using the more compact (APS-C) digital size image sensors. The focal length of this lens is equivalent to approx. 28-300mm in 35mm format. Designed as an "all-in-one" lens, it will meet almost all photographic opportunities without changing lenses. XR (Extra Refractive Index) glass design reduces various aberrations to the absolute minimum and achieves remarkable downsizing at the same time. In addition, three hybrid aspherical lens elements and two LD (Low Dispersion) glass elements are used to accomplish effective compensation of on-axis and lateral chromatic aberrations, a critical factor to enhance the optical quality in digital photography. Lens features Internal Surface Coatings (i.e., multiple-layer coatings on cemented surfaces of plural elements) and new multiple-layer coating technology on ordinary elements in order to minimize reflections that occur when light enters through the front element and to reduce image degrading effects caused by the imagers themselves. Design has been improved by adding a gold-colored band between the focus and zoom rings to enhance the appearance and make it stand out as a Di-II lens. The rubber patterns of the zoom and focus control rings have been improved at the same time to compliment the digital camera design style and to provide better handling.